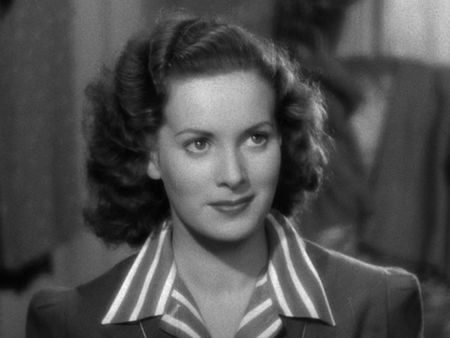 In movies as diverse as How Green Was My Valley, Miracle on 34th Street, The Quiet Man, and The Parent Trap, Irish beauty Maureen O'Hara made a lasting impression with a screen image that combined serenity with a fierce determination. Is it any wonder that Warner Bros. has gotten around to dedicating one of their four-film Turner Classic Movies Greatest Classic Legends sets to this living legend? While this affordable package doesn't include any of the movies I mentioned (all great, none owned by Warner Bros.), the quartet of plush Hollywood productions included here serve nicely as a showcase for O'Hara's versatility and classic beauty. Although Victor Hugo's The Hunchback of Notre Dame has reached the screen several times over the years, Charles Laughton's incredible poignancy as the lovelorn bell-ringer Quasimodo helped make RKO's 1939 production the definitive one. 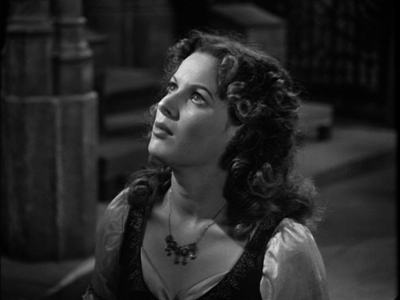 O'Hara was pretty affecting, too, in her first Hollywood film as Esmerelda, the alluring gypsy girl and seemingly sole resident of 15th century Paris who views the hunchback as a real human being and not a pitiable monster. Hugo's story is rather complicated, encompassing dozens of minor characters, yet director William Dieterle managed to make this a concise, enthralling film despite its long running time. The lushness of this Pandro S. Berman production still impresses, while seeing it again after so many years (decades?) I'm just now noticing all the excellent supporting actors. Recognizable from so many other vintage '30s-'40s flicks, you've got Thomas Mitchell, Cedrick Hardwicke, a young and athletic Edmond O'Brien, Harry Davenport et. al. The DVD in this set is mastered from an old edition (from 1997) and perhaps not the best way to first experience the sumptuous visuals, but for O'Hara's sake it's a magnificent inclusion. For O'Hara, the juicy musical melodrama Dance, Girl, Dance came as a complete shift of gears from Hunchback. Sympathetically guided by the sole woman director in Hollywood at the time, Dorothy Arzner, O'Hara plays a young dancer named Judy, whose dreams of becoming a prima ballerina are steamrolled over by Bubbles (Lucille Ball, in one of her best film roles), her flashy fair-weather friend. As Bubbles ascends through the ranks of New York's showbiz world in a naughty burlesque act with a reluctant Judy as her stooge, the two characters end up being a sort of a ying-yang of femininity - Judy plays it demurely and constantly gets her heart broken, while Bubbles' brassy appeal makes her one of the guys - even if it means losing her dignity. Lively, thought-provoking and padded out with a few too many musical numbers, Dance, Girl, Dance nevertheless sat in obscurity until '70s revival house programmers hailed it as a proto-feminist statement. Except for O'Hara's stirring speech dressing down all the vulgar, ogling men who came to see Bubbles shimmy and strip, however, there isn't too much feminist subtext. Mostly, it's a crackling, smoothy made comedy-melodrama that made room for two actresses at their peak (a rarity in its own right). As the '40s soldiered on, it became apparent that the flame-haired, creamy-skinned O'Hara was one of those actors who looked sensational when photographed in color. Thus, she ended up getting cast in several lavish, swashbuckling sea adventures making great use of Technicolor film, of which The Spanish Main is one. This RKO production pulled out all the stops, pairing O'Hara with Paul Henreid (Now Voyager) under the direction of the esteemed Frank Borzage (The Mortal Storm), yet several factors ultimately make it a rather routine adventure pic. 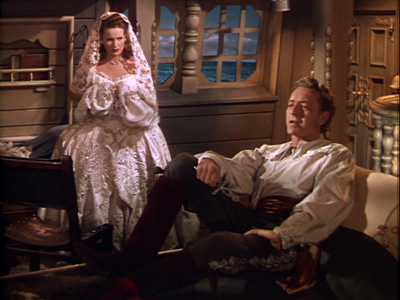 Henreid is improbably cast as Captain Laurent Van Horn, the swarthy, virile leader of a group of Dutch refugees who commandeer a ship containing a lovely Mexican noblewoman (O'Hara as Contessa Francesca) on her way to marry Don Juan Alvarado (Walter Slezak), an uncompromising Spanish ruler whom she's never met. In order to save her ship, Francesca becomes the captain's unwilling bride, prompting an irate Don Juan to imprison Van Horn and his men once the party reaches Spain. A decent swashbuckler, gamely performed and nice to look at. Except for Binnie Barnes as a rowdy lady pirate in love with Henreid, however, the story and characters were all too familiar. Previously available only as a made-to-order disc from Warner Archives, The Spanish Main is done here as a commercially pressed DVD for the first time. 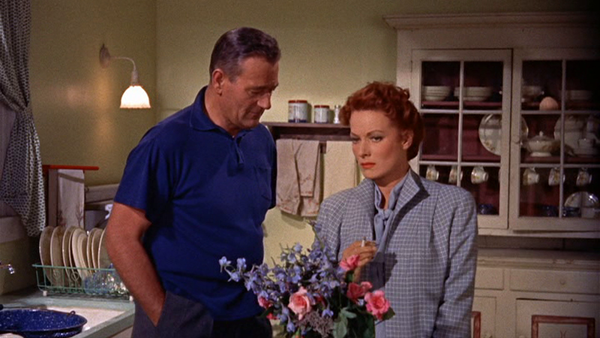 Of all of O'Hara's co-stars, John Wayne was probably the most simpatico. 1957's The Wings of Eagles came along right in the middle of their five films together, a breezy biopic which reunited them with The Quiet Man's director, John Ford. With Wayne pretty much being himself as the rowdy Navy pilot-turned-screenwriter Frank "Spig" Wead and O'Hara as his fiery wife, Min, this lavish MGM production fails to do anything new, but the cast and director's apparent ease with each other makes it a fun, somewhat schizophrenic watch. The story veers from frenetic, rowdy action to outright melodrama, with a dense story that hinges upon an accident which left Mr. Wead paralyzed from the neck down. This being a rousing Wayne-Ford collaboration, however, the story never bogs down in sentimentality. As biopics go, this one plays more "meta" than the norm (Wead scripted Wayne's WWII film They Were Expendable, among many others). O'Hara's character ends up being sorely missed, disappearing for long stretches of time, although her absence is made up for with Dan Dailey as Wayne's boisterous Navy buddy ("I'm gonna move that toe!") and Ward Bond as a showy, eyepatch-wearing movie director with a strong resemblance to Mr. Ford. The Maureen O'Hara Classic Legends Film Collection sports the same classy exterior packaging as others in the series, although the interior is slightly different than what I was used to. As explained in a review of the Marlon Brando set by DVD Talk's Tyler Foster from 2011, these sets used to contain four films on two double-sided DVDs. Now, the four films are done on individually pressed DVDs with label artwork, stacked on the same spindle within the standard keep case. As awkward and more prone to scratches as that setup is, I suppose consumers didn't favor the old double-sided format and Warners listened by switching to this less-than-elegant solution. Two discs or four, the list prices have remained the same. The video and audio carries over from the individual DVD releases of these films from way back when (really - the Hunchback disc dates all the way back to 1997!). Except for the aged, dust- and scratch-ridden print used on Hunchback, these discs look excellent, with crisp mastering and a cleaned-up, pleasantly balanced image. The Wings of Eagles has a handsome 16:9 anamorphic widescreen presentation, while the other three films are done in 4:3 full-frame to preserve their original aspect ratios. All four discs sport the films' original mono soundtracks in dynamically limited yet clean and appealing mixes. Pops and hiss are a rare occurrence on these tracks, which tend to get fuzzy on the louder end but generally sound good. Subtitles in English, Spanish and French are included on all discs except The Spanish Main. Also carried over from the original releases, this set includes a 1997 making-of featurette with O'Hara sharing her memories and some text-only information on The Hunchback of Notre Dame, and theatrical trailers on The Wings of Eagles and The Spanish Main. Dance, Girl, Dance contains some delightful vintage-1940 short subjects: the Cliff Edwards comedy Just a Cute Kid and Malibu Beach Party, a Warner Bros. cartoon starring Jack Benny and a host of animated celebrities. 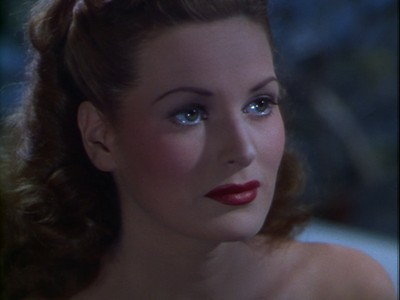 Maureen O'Hara lovers, represent! For those who didn't get around to acquiring these four films as individual DVDs, the Turner Classic Movies Greatest Classic Legends devoted to Miss O'Hara serves as a good, attractively priced primer to the timeless Irish-American beauty. Recommended.